Vintage From Paul is delighted to offer these pristine condition Sarah Jordan Greenfield Village Henry Ford Museum Dinner Plates. Part of the Henry Ford Museum Collection, these dinner plates were manufactured by Iroquois China. The Sarah Jordan dinner plates have a creamy ivory body, slightly fluted edge and a charming and lovely brown transferware desigh with polychrome accents. The Sarah Jordan Boarding House, now located within the Henry Ford Village Dearborn Michigan, is where Thomas Edison's bachelor assistants lived here while working on such inventions as the phonograph, telephone transmitter, and incandescent lamp. To celebrate New year's Eve 1879, they wired the house, their laboratory and the street between, making this the world's first electrically lighted home. It was moved to Greenfield Village from Menlo Park, N. J. 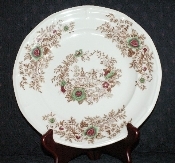 The Sarah Jordan Greenfield Village Henry Ford Museum Dinner Plates measure 10-3/8 inches in diameter. The Sarah Jordan Greenfield Village Henry Ford Museum Dinner Plates are marked with "The Henry Ford Museum and Greenfield Village, Dearbown Michigan, The Museum Collection, by Iroquois U.S.A., Sarah Jordan""
Each available Sarah Jordan Greenfield Village Henry Ford Museum Dinner Plates is in pristine condition with no defects or flaws noted. The plates appear to be unused.